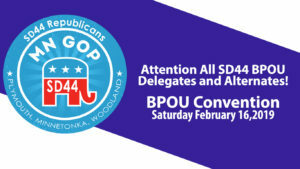 Delegates and guests are invited to attend the SD 44 Convention on Saturday, Feb 16. The convention will be held at Wayzata Central Middle School and begin at 9:00 am. Please arrive early in order to get registered and seated. Candidates interested in being considered for delegate to the state and congressional district conventions should email jcrowe0602@yahoo.com by 5:00 PM on Thursday February 7, 2018.